​ And there she goes like every mortal. She has gone home, but her off-springs and well wishers are celebrating her departure, for a life well spent. Her name is Hannah Didelou Awolowo, a Nigerian of immense stature and goodwill, who will be interred in her hometown of Ikenne, West of River Niger, on November 25, the same date she was born, some ninety something years ago. Was Hannah Dideolu born great? Did she struggled and achieved greatness or was the greatness she had before succumbing to death entrusted on her from birth or rubbed on her by marriage? First, Hannah is a great name in the Christian scripture, whose misfortune about her inability to conceive and have a child at the appropriate time is legendary, before she gave birth to Samuel. And Samuel was great. But in the case of the Nigerian Hannah, she seemed to have been married to an equivalent of Samuel - Chief Obafemi Awolowo - first governor of Nigeria's Western Region, who had political power for good and evil, but who nonetheless chose to benefit the ordinary people with the power that God entrusted in him. Hannah's husband was the man Nigeria's popular rebel with a cause, Odumegwu Ojukwu, called the best president that Nigeria never had. Awolowo had the foresight of what education could do in human lives. He he seized the opportunity of being there at that particular time and gave free education to young people, who considering the financial misfortune of their parents, would have have had no access to education in life. After he surveyed the situation in his country, he thought and believed that he could as well repeat what he had done in his region in the entire country, he then bid for the political power to enable him. But he was barred by the ten percenters. He was also not allowed to regain the power he had given to one of his lieutenants in his home region. His further efforts in seeking political power at the center was frustrated by the rich who gathered like legions against him.. He was tried for treasonable felony and deprived access to power to improve the lives of commoners. He died struggling to become a president. In all his struggles, Hannah Dideolu stood by him. She did not faint or lose strength or asked the husband to give up. When her husband was under house arrest in far away Calabar, she held the home together in Ikenne and worked toward the success of his enterprise to make Nigeria a better place. In the words of Paul Simon in one of his songs, Awolowo and Hannah's life as a couple is proof that it takes two bodies to join them into one hearts and bones, and that they must have loved each other like a rock. He was her only husband and she was his only wife. 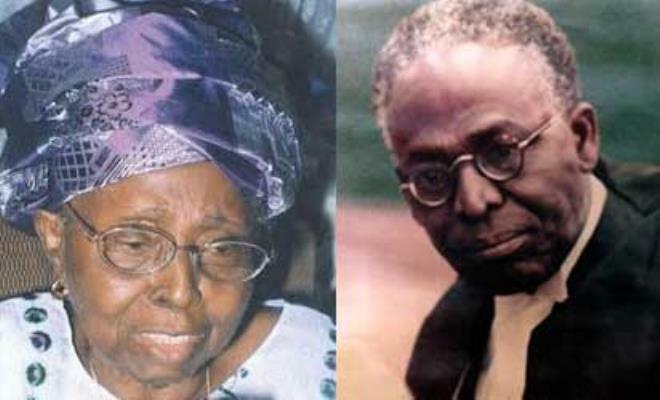 The praise that is due to Hannah Dideolu is the influence she may have had on Awolowo as a young man and elder statesman, because we all know that the woman in a man's life do have influence on whatever the man does. It is not for her wealth or association with evil personalities to oppress others for personal aggrandizement. Hannah Dideolu did not hold any political office. She may have been a trader or a business woman, but from the outlook of her family structure, the upbringing of her children, their well being and education must have been most uppermost, and not imposing her own will on the husband. And if she did, her will must have been positive. She allowed him unfettered and developed; allowed him asked difficult questions from people in power, who sought to subjugate the country as their personal fiefdom. And there she goes into near immortality unlike every other humans but like her husband before her and others who have benefited humanity, showing that the good that people do... do lives after them, and the evil interned in their bones. Sleep well Hannah Dideolu. You and your husband positively affected many lives. The free elementary education I had from your husband's free education program gave me the knowledge and opportunity to later wrote the General Certificate of Education GCE in ordinary and advanced level as a private candidate. That little bit of education later became a launching pad for me, and had saved me from being called 'laggard' by the teetotalers of the Nigeria's privileged class and their masters. Believe me, I am not an empty vessel or a loud barrel that makes noise like many Nigerian politicians, who have been praising and pouring encomium on Hannah Dideolu. Many of these privileged politicians either belong to the group of useless people who stood between Awolowo and his dreams or themselves some of who used their wealth to barricade him from power. Awolowo did not seek president at all cost by dinning with thieves and corrupt people. He stood on his own and called the corruptly rich their name as subjugators of the Nigerian nation. He said that if he had the opportunity to be president, he would transform and the opposite was what his opponents stood for, and up to this day. They have power and either don't know what to do with it or they have been evil from their mother's womb.